JEANETTE’S HURRICANE TIPS FOR ANYONE WHO USES CPAP OR HAS PERHAPS THE NEED TO CHARGE SOMETHING IF THERE’S NO ELECTRIC, THERE IS A PRODUCT CALLED ZERO ONE. IT STORES ELECTRICITY IN ITS BATTERY. YOU CAN CHARGE IT WITH SOLAR OR ELECTRIC. Of course electric is fastest way. My son bought me one.its great. 1. CHARGE ZERO ONE AND ALL ELECTRIC LANTERNS CELL PHONES LAPTOPS IPADS AND COMPUTERS ( The computer devices are a great source of light when electric goes out. If you need a brighter light go to email. That page is white n provides brighter light. If you lose landline you’ll be happy your cell was fully charged. Need it to call for medical or other help. High winds and so much rain cause car accidents that sometimes disturb telephone poles and electric poles causing interruption of service sometimes for long hours. 2. PLACE POTTED PLANTS IN A LOW, SAFE LOCATION ( Like under a lanai table thats against a corner or wall) TO PREVENT THEM FROM BECOMING MISSILES IN HIGH WIND THAT CAN BREAK YOUR WINDOWS. Can put in garage but that’s too much work. This works well. 3. SCRUB TUB WITH BLEACH AND FILL WITH WATER. If a sinkhole occurs from ground saturation that disrupts water supply or tornadoes which are many times spawned, or stop the water supply, you will have water to flush toilets and that can be used to bathe in your sink or even boil for coffee and do laundry if lights are still on. When water mains break oftentimes the initial next day after the repair water is contaminated too. DO ALL LAUNDRY before the lights have potential to go out. 4. WATER ALL YOUR PLANTS that are indoor plants so you don’t need to waste emergency water. 5. GET TWO OLD GALLON MILK JUGS AND FILL WITH WATER. Keep them all year in the freezer. When the lights go out take one gallon jug and stick it in the center of the refrigerator. It will keep your food cold for many days. I have used this successfully many, many times. 6. MAKE SURE ALL FLASHLIGHTS AND SMOKE ALARMS HAVE GOOD BATTERIES. have replacement batteries of all sizes on hand in case you need them. 7. UNPLUG ALL LAMPS, COFFEE POTS, ANSWERING MACHINES anything you don’t use to prevent them from getting zapped and ruined by lightning. Chances are you will not be driving in hurricane winds and rain so you’ll be home and won’t need the answering machine anyhow. BEATS buying new things. I’ve lost two answering machines from lightning. Surge protector bars for computers do work. There are many kinds that are for different things. Be sure to check before you buy. It’s a great investment n usually a one time purchase. 8. RENEW YOUR MEDICATIONS BEFORE THE STORM IS GOING TO MAKE LANDFALL. once the Governor issues a state of emergency it is the law that you can renew your medications early. Be sure to have aspirin and Tylenol and bandaids, whatever you might need if you’re stuck indoors due to the storm or flooding and get sick or injured from say for example tripping in the dark, spraining an ankle etc. 9. HAVE CANDLES . good to burn in a glass in a sink with a little water in it to reduce risk of fire. During the day you can open your blinds and utilize the light from outside. 10. HAVE ENOUGH FOOD AND WATER FOR YOU AND YOUR PETS Manual can openers are necessary. If the lights go out your electric can openers will be useless. 11. FINE CHINA ( paper plates, utensils and cups) so you don’t have to use emergency water. Plus, lol no dishes to do! LESS WORK IS ALWAYS A GOOD THING. 12. CHARGE BATTERY POWERED TOOLS to ensure they have full charge so that if after the storm there is no electricity you can still do clean up or repairs. 13.STERNO CANS AND ALUMINUM PANS. these come in handy to cook if you have no electric. 14. HAVE CHARCOAL OR FULL PROPANE TANK FOR BARBECUE If when the rain stops electric hasn’t been restored you can cook. Because of flooding, sinkholes trees down, you may not be able to get to the store. 15. POWDERED MILK ( there is a brand called NIDO ) you can get it in supermarkets. It’s the very best tasting and vitamin enriched powdered milk I’ve ever tasted in my life. It’s the only one I’ll buy since I discovered it. 16. PROTEIN SHAKES like Atkins, ENSURE, GLUCERNA ( for diabetics) These do not have to be refrigerated and can be used in place of a meal. 17. SECURING YOUR GARAGE DOOR . I have a wide aluminum door. If it starts rattling, I take tall pieces of plywood n place it against the door from top to bottom in the center area of the door and gently roll my car backwards to press against the wood. I believe the sturdiness of the wood and the weight of the car against it, will stop it from blowing in. 18. NOAA RADIO or other emergency radio. They are inexpensive and could save your life. I keep mine plugged in all year. I went on line and found the codes for each county n programmed it to only alert me for tornados etc in My county and the nearby counties. The first night It was going off all night because it was telling you things in oklahoma etc. it has a backup battery too like answering machines do, and you’ll wake up to some beeps and people voices telling you what’s coming and where it is. Once you program the codes into it, it will only sound for the counties you asked it to warn you about. Is your Welcome mat screaming, “HELP ME! ” instead? Due to the invention of garage door openers, I rarely use my front door.I have had it painted white since 1985 LOL. I wanted a bright cheery color for some time now. 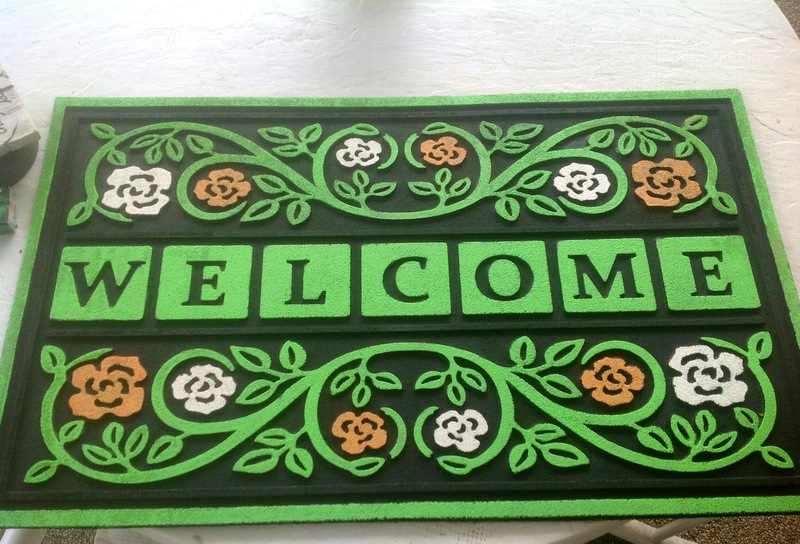 I did know that my welcome mat has been worn for some time now but did not have the means to replace it. 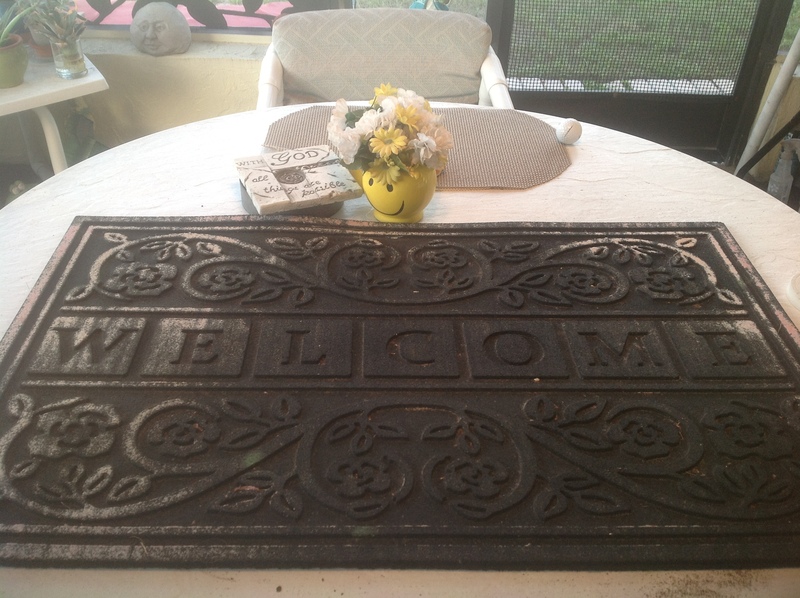 After painting my front door, my welcome mat not only looked worn, it was screaming, ” Help Me! ” . So, I decided to paint it. Yes, paint. It is a rubber mat, very thick and sturdy. So I took the exterior door paint and painted all the trim and designs that were raised and the flat surfaces I painted black as it originally was. Then I took craft paint and painted the flowers. Once dry, I coated it with three coats of clear spray paint that bonds to plastic so that it would protect the paint from rain and make it last longer. Hi everyone! I came across these videos that I truly love! The simplest ways I have ever seen to make a big job easier or just to maintain a sense of well being. Some of us may already know that having a lot of clutter around not only makes our day to day cleaning harder but also affects our ability to concentrate. In this “oh so busy, fast paced world” we find ourselves living in, I don’t know about you, but I find comfort in getting home at the end of the day and relaxing. Enjoying the peace of mind that comes with being able to shut out everything and just being able to be free of the worlds demands on us is so soothing to my spirit. 1. Use a coffee filter instead of paper towels to clean glass and mirrors. You will get a streak and lint free shine. 2. Sand the ends of your paintbrushes flat. You will now have the perfect dotting tool. 3. Bad odor in a small place? Place coffee in a filter or container and put into your small space. It will absorb the odor. 4. Have leftover soysauces, duck sauces etc from a takeout meal? Don’t discard. Place in ziplock bag or container and store in refrigerator. They’ll be neatly stored, out of the way and may be useful in a recipe. 5. 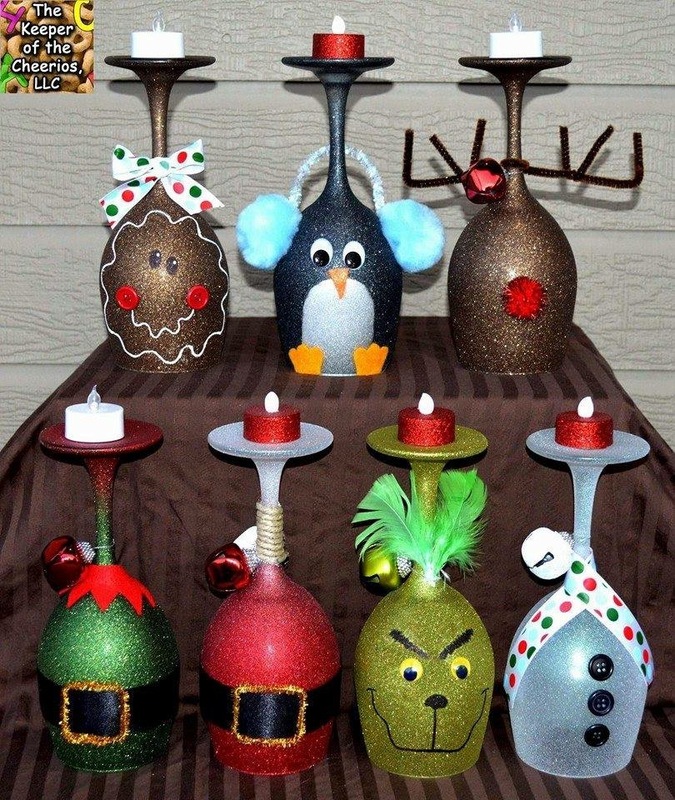 Like to spray your home with scented sprays? Save money by spraying onto your A/C filter. It will distribute the fresh scent to your entire home at once . 6. Throw pillows getting a little flat? Pop in your dryer on air dry setting for a few minutes. They will be fluffy as new. If you use a dryer sheet they will smell fresh too. 7. Have too many small wallet sized photos? Buy a roll of magnetic strip and turn them into refrigerator magnets. 8. Love your lamps but have changed your decor colors? Get some craft paint and paint them. 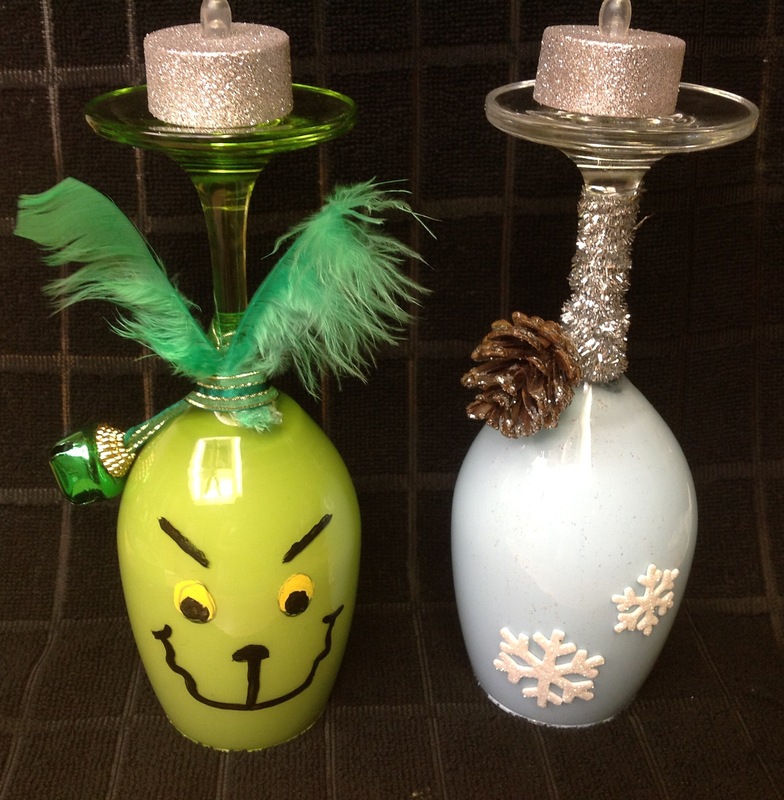 Spray with a clear spray paint to finish them off. 9. Move into a home with old switch plates? Save money and time searching at the store. Take them all off, wash and dry them and spray with white spray paint or whatever color you desire. They will hold up to cleaning for many years. 10. FOR ADULTS ONLY…. Want a new twist on your hot cocoa? Try adding a teaspoon of amaretto, romana sambvca, or your favorite liqueur . This is such a nice tutorial I found, I thought I’d share it with you. The woman is a very good teacher and has a very soothing voice. Thefact that you can pause it until you catch up is a plus too. Enjoy! Happy crocheting! Wow! I love wrapping and usually don’t have any issues in that department. However, the sites listed below are really fantastic. The Japanese make it into an art! I thought I’d share these with you. Let me know what you think.